Have you ever stared into the depths of your A&P textbook and wondered who named all that stuff? There is a dizzying array of anatomical structures, substances, and processes that you’ve either already memorized or are in the process of learning. Why do nearly all of them have Latin names? Today we’re going to put on our etymology hats (what, you don’t have one?) and explore the origins of some anatomical names. Tally ho! First, let’s take a trip back in time to Ancient Greece, the origin of one of the first collections of medical texts in the West. The Hippocratic corpus, written between the sixth and fourth centuries BCE, served as the foundation for Western medical thought and practice for many years. Though Hippocrates himself was not the author of these works (and probably not of the Hippocratic Oath, either), he is considered to be the father of medicine, a great physician who established the ethics of what it meant to be a doctor. In the second century AD, Galen of Pergamum served as a further bridge between the work of early Greek doctors and the medical practices of the Roman Empire. During the Middle Ages, many Greek medical texts (like Galen’s work) were translated into Arabic. However, during the late Middle Ages and the Renaissance, these texts were translated into Latin and studied by the scholars of Europe’s universities. Time for another jump forward, this time to the Renaissance. 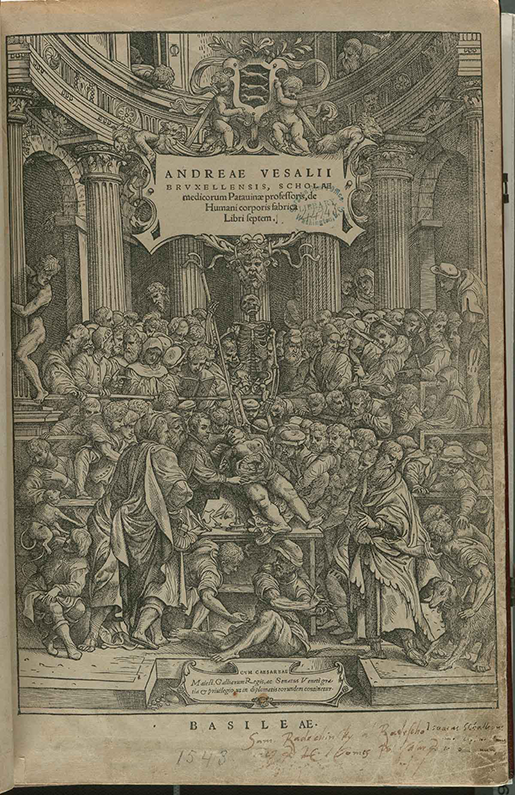 In the 16th century, the physician Andreas Vesalius composed De humani corporis fabrica libri septem (“Seven Books on the Structure of the Human Body”). Though Vesalius and his contemporaries attended dissections at their universities, scholars of that time relied primarily upon the work of ancient anatomists like Galen. However, Galen had based his writings on animal dissections because dissecting human bodies wasn't permitted in Ancient Rome. Vesalius therefore revolutionized the scientific study of anatomy by incorporating the firsthand dissection of human cadavers into his written work. The title page of Vesalius' magnum opus. 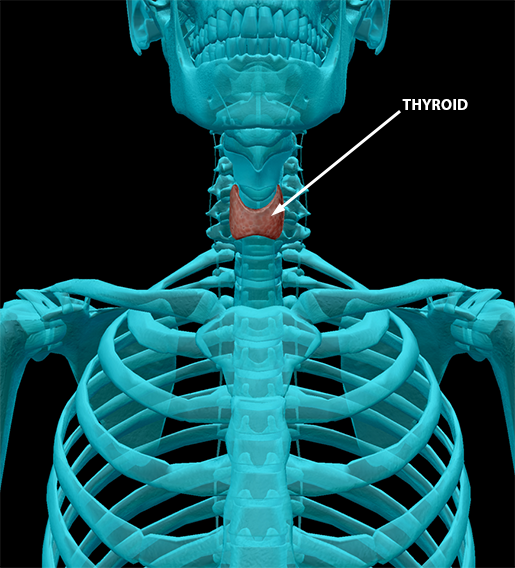 Image from the U.S. National Library of Medicine. Where does language come in? Until around the 17th century, Latin was the language of science and learning in Europe. It was a lingua franca shared by educated individuals from a wide range of linguistic backgrounds. The majority of pre-Enlightenment academic texts in Europe were written in Latin (Newton’s Principia Mathematica, for example), although as time went on it became more common for authors to write in their own vernaculars either in addition to or instead of composing works in Latin. The “tl;dr” version of all this is that many of the anatomical terms we use today came directly from Latin, came from Greek and were translated into Latin, or were translated from Greek to Arabic and then into Latin. Thus, many of the terms we see in modern medicine have mixed Greek and Latin origins. We still use the Latin names mostly because that was the cool thing to do back when medicine and the scientific study of anatomy were coming into their own in Europe. Okay. History lesson over. Time to take a look at some interesting examples of the etymology of body part names! The first anatomists didn’t have a system of nomenclature already in place, but the names they chose for the parts of the body they encountered weren’t wholly arbitrary. Early anatomists drew on the world around them for inspiration, often comparing the appearance of parts of the body to familiar creatures and objects in their environment and cultures. Consider the hippocampus. This cute little piece of the limbic system gets its name from the Greek word hippokampos, which refers to a sea monster. In Latin, hippocampus is the word for a mythological sea monster with the head of a horse and the tail of a fish — in more everyday terms, a seahorse. In fact, the species name for the Pacific seahorse is Hippocampus ingens. Given the curved shape of the brain’s hippocampus, it isn’t difficult to see why it was named after a seahorse. 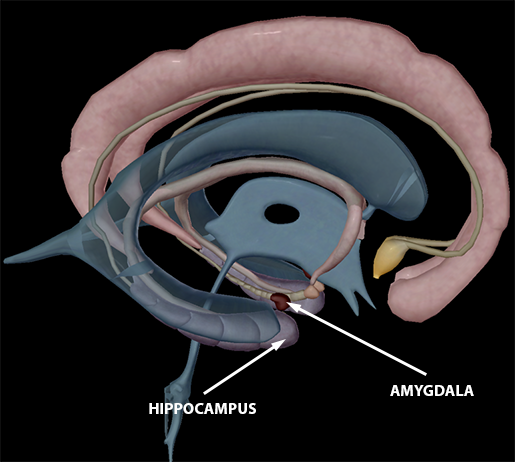 The other structure labeled in the image above is the amygdala, one of the hippocampus’ compatriots in the limbic system. Its name comes not from the Queen of Naboo but from the Greek amugdalē, meaning “almond.” The amygdala in the brain usually has a volume of about 1.24 cm3, which makes it a bit smaller than an actual almond, but you can kind of see the similarity in shape. Have I mentioned that in addition to seahorses, you’ve got a worm in your brain? Don’t worry, it’s supposed to be there (and it’s not an actual worm). 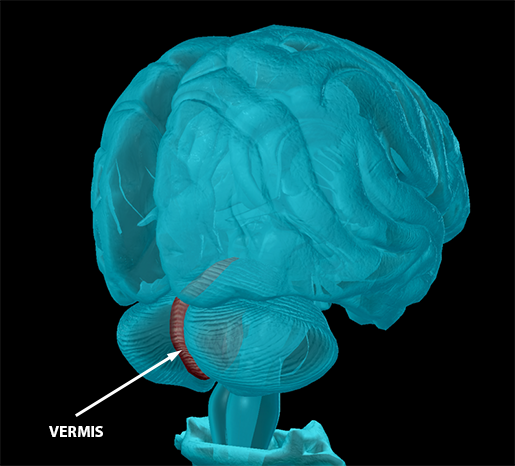 I’m talking about the vermis, the structure connecting the two hemispheres of the cerebellum. Its name comes from the Latin word vermis, meaning “worm.” Again, the resemblance is fairly clear: the vermis is segmented, just like its namesake. Moving out of the brain, we’re now going to look at the name of a part of the ethmoid bone, which sits just above the nose. 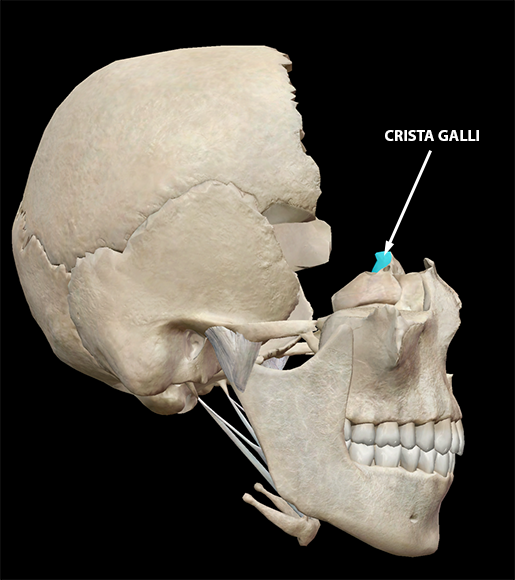 The crista galli, the little ridge that sticks up out of the middle of the ethmoid bone, is named for the crest on top of a rooster’s head. Literally, crista galli is Latin for “crest of the rooster” (crista = tuft/crest, gallus = rooster). 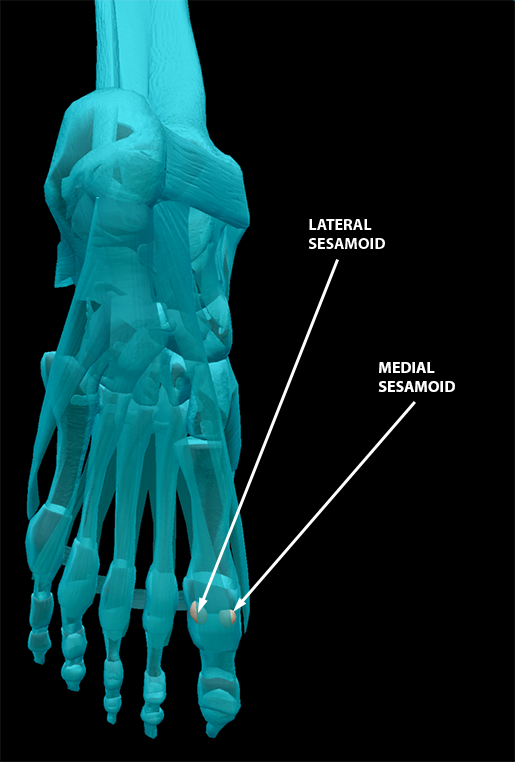 Even though I still don’t know how to get to Sesame Street, I do know that there are foot bones that (apparently) look like sesame seeds: the medial and lateral sesamoid bones! Galen is responsible for naming these bones, combining the Greek words sesame (= sesame) and eidos (= resemblance) to get the meaning “resembling sesame”. And now, a bone named after my least favorite vegetable (or fruit? ): the pea! 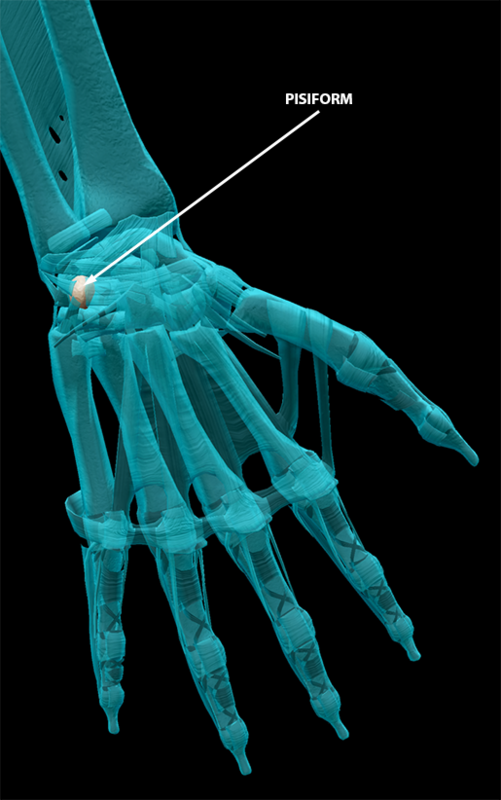 The name of the pisiform bone comes from the Latin words pīsum (= a pea) and forma (= form). As I mentioned earlier, body parts were named after man-made objects as well as flora and fauna. We can thank Galen (or at least the scholars who translated his work from Greek to Latin) for the retina’s name. 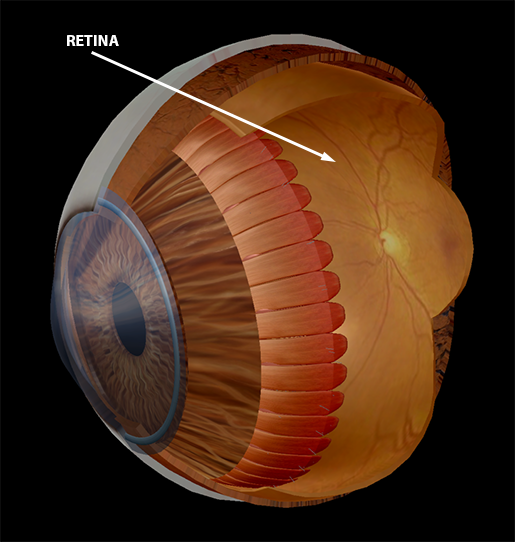 The word “retina” comes from Latin rete (= net). The Greek name Galen applied to the retina was amphiblestron, which could mean either a coat or a fisherman’s net. Given that the retina is the innermost layer of the eye and that it wraps around the eye’s vitreous body, perhaps the “coat” translation would have been a little more accurate. It was probably what Galen intended. 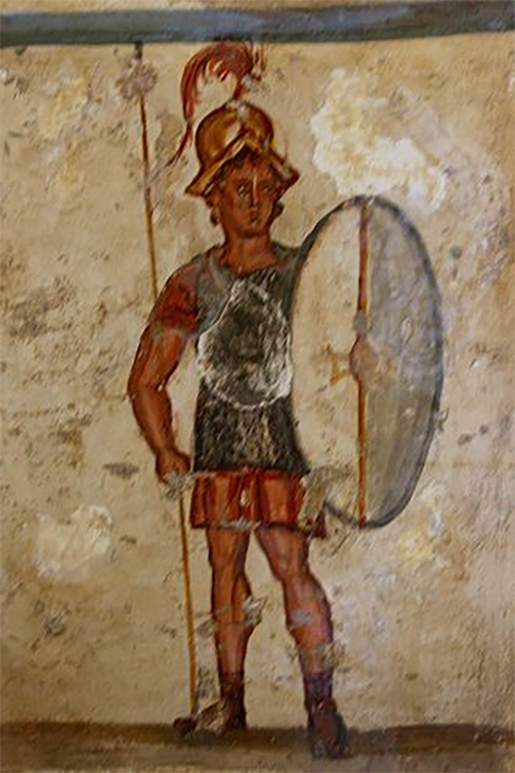 An ancient Macedonian soldier with a thyreos shield (from the archaeological museum in Istanbul). Source. 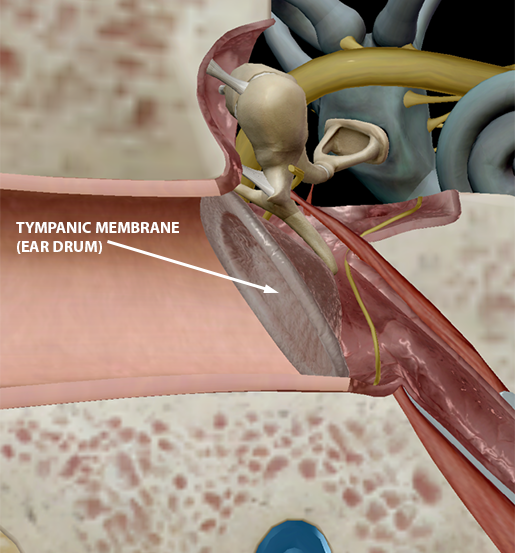 The eardrum’s fancy scientific name, the tympanic membrane, comes from the Greek word tympanon, meaning “drum.” Just like the surface of an actual drum, the eardrum vibrates. However, it’s stimulated to vibrate by soundwaves, not by being hit with a hand or mallet (please refrain from damaging your eardrums this way). Lastly, there are a whole bunch of body parts that get their names from people, both fictional and real. Some of these don’t necessarily fit the Latin/Greek mold, as many parts of the body were named for the people that discovered and studied them, but there are some fun connections to Greek mythology too. 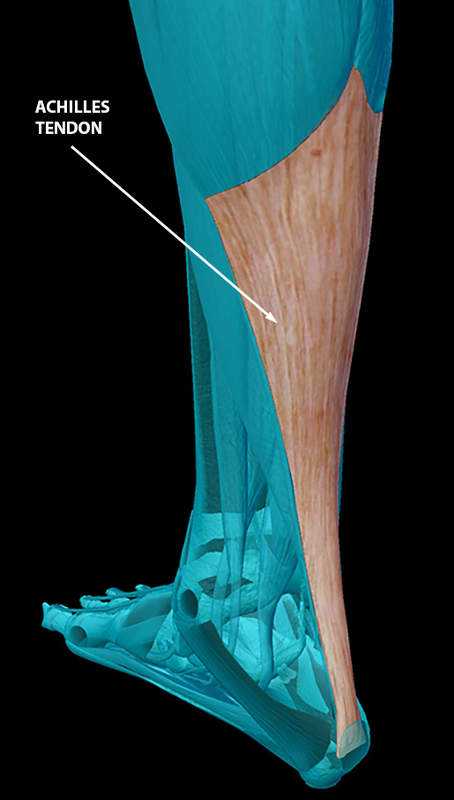 The Achilles tendon is named for one of Greek mythology’s most famous figures. The great warrior Achilles only had one weakness — his heel — because when his mother Thetis dipped him into the River Styx as a child, she held him by that heel and the waters of the magical river never touched it. Thetis’ questionable parenting aside, the Achilles tendon is so named because it extends down the calf to the heel. 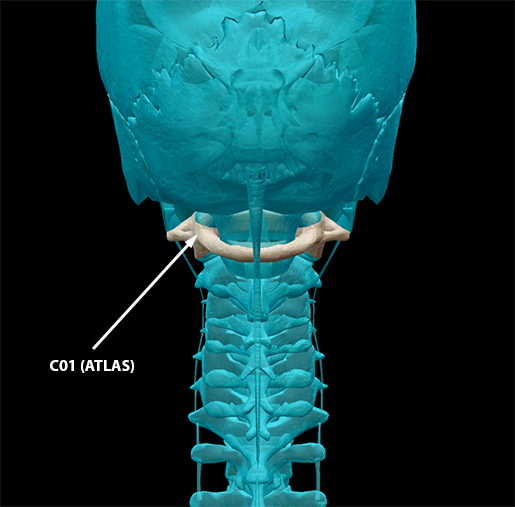 Another body part that gets its name from a character in Greek mythology is the first cervical vertebra (C01), otherwise known as Atlas. Atlas was originally the name given to C07 by Julius Pollux, one of Galen’s contemporaries. It was only in the 1500s that anatomist Jacopo Berengario da Carpi applied it to C01 instead. Since C01 sits just beneath the head (which is big and globe-like) and teams up with C02 (axis) to form the joint connecting the spine and the skull, it plays a similar role to the mythological Titan who held the world on his shoulders, supporting a heavy but very important burden. 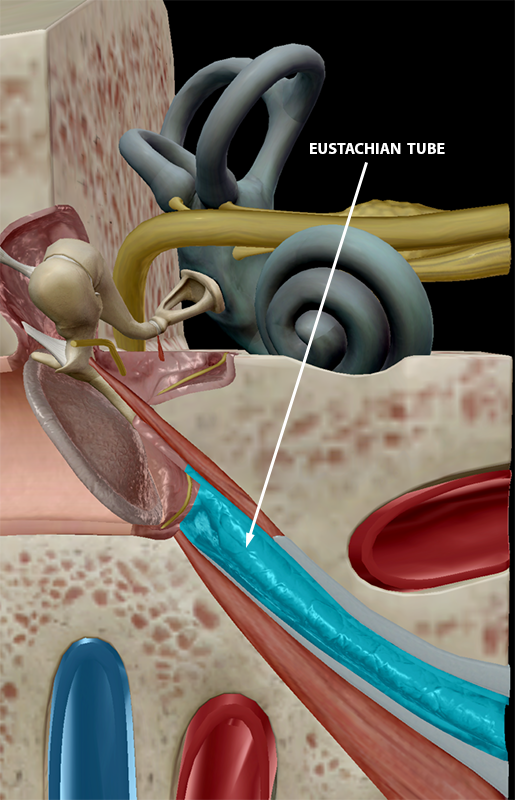 The Eustachian tubes were named considerably more recently than some of the items on this list, as their namesake is Bartolomeo Eustachi (aka Eustachius), an anatomist from 16th century Italy. Though Eustachius wrote an anatomy book called Anatomical Engravings in 1552, the manuscript wasn’t officially published until 1714. It seemed Eustachius’ work was a little too edgy for the Catholic Church at the time when he was writing, but his name has lived on in the pressure-regulating tubes of the middle ear that we all know and love today. I could go on about fun word roots all day, but you probably get the gist by now. There is a rich linguistic history behind the anatomical terms we use today, and exploring it really brings A&P vocabulary to life (so to speak)! If you’re feeling inspired, or you’re a Latin language enthusiast like me, take a look at this page from Emory University — it’s a dictionary of medical terms with more Latin and Greek word roots than you can shake a stick at. If modern languages are your jam, there are also quite a few articles discussing how English is becoming the new Latin — that is, English is increasingly becoming the common language of science. Here’s a particularly thorough one from Aeon.